Today, DeLoach, Hofstra & Cavonis is seeing great reviews coming in on a wide variety of sites at different time intervals. They went from only a few reviews to an abundance of great reviews, and they have even received positive comments about them. Website traffic is up, and Simone was able to make the process a fun, rewarding, and collaborative experience for her team. Simone took an excellent approach to the process. 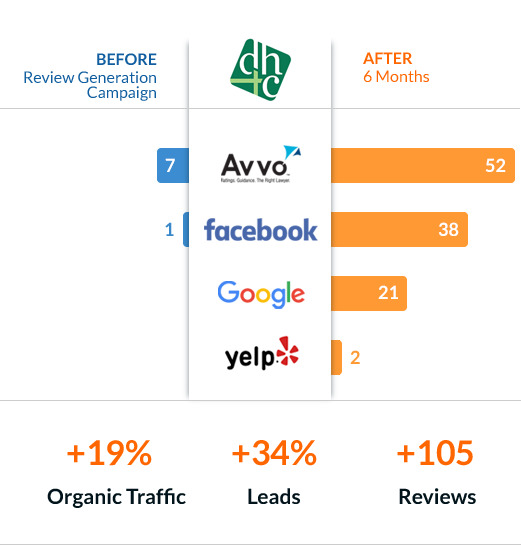 Pick the review sites to focus on - Google, Facebook, and Avvo are all great to start on. Identify the clients to focus on - loyal past and current clients along with business partners in the local community who’ve used their services. Timing - the team requested feedback as cases came to a close or when clients seemed happy. Pro Tip: In some cases, hiring an attorney is not necessary. However, if a client receives free legal advice, seeking reviews is completely legitimate and almost always results in positive feedback! Lastly - The firm employed a very good strategy—the team reached out to clients they enjoyed working with and who enjoyed working with them. Because of this particular strategy, DeLoach, Hofstra & Cavonis is now targeting more of the clients they want to work with! By generating reviews from some of their best cases and clients, they may rank better in searches related to those practice areas. Once the strategy was outlined, the firm got to work. They set up a review email template with custom links to the review sites they were targeting. Then, the emails were then sent to the clients from the firm member who worked with them directly. Requesting feedback and explaining that it would be helpful to others facing a similar situation made current and former clients feel valued. As reviews rolled in, the team used Foster Web Marketing’s Reputation Management tool to receive alerts, manage, and respond to them. But the team did not stop there: they also took a more direct approach, asking clients for reviews in person. To be sure everyone understood the strategy and took the right approach, Simone held three online review workshops to answer any questions the staff had. Then, they turned review generation into a fun and friendly competition. The staff member with the most reviews over a one-month period received a $25 gift card, and the staff member with the greatest number of reviews in the quarter received a $50 gift card. This encouraged the staff to work on reviews over time rather than trying to get a huge number of reviews at once. Simone announced the winner in an all-staff email and decorated the winning staff members’ work stations. Gift cards came with congratulatory cards signed by all of the DeLoach, Hofstra & Cavonis attorneys, and they were presented to recipients by their direct-report attorneys. This added recognition and gravitas to the occasion. Of course, the attorneys also participated in the contest, but they decided not compete for the prizes—they really wanted to celebrate the efforts of the staff. The firm also used a scoreboard to gamify and track their reviews. They posted the reviews in shared office spaces so the team could see them. This was not only a great way to celebrate their successes, but it was also a good reminder to keep seeking new reviews. If a staff member was mentioned by name on Facebook, they were encouraged to comment from their personal account, if they felt comfortable doing so. The trick is keeping the importance of getting reviews top of mind for everyone in the office. This can be accomplished in a number of ways. DeLoach, Hofstra & Cavonis’ site has seen 19.23% growth in organic traffic since October 1, 2016, when the campaign started. There were a number of positive changes happening at this time, but it’s pretty safe to say the new reviews have definitely contributed to this significant growth! Even better than the organic traffic, however, has been the direct response to these positive reviews. The firm has received calls in which a potential client specifically said they were looking around online and decided to call after seeing the great reviews. One of the firm’s attorneys received an email complimenting him on his reviews—that client ended up choosing DeLoach, Hofstra & Cavonis because of those reviews and the firm’s reputation. When we asked Simone about the benefits of this review generation campaign, she couldn’t say enough good things! "So many people say they do not know what they would have done without us or that we provided them with peace of mind. They always want to know how they can thank us, aside from the payment. Providing reviews helps the clients feel good too—it can even bring closure to some very heart-wrenching cases. We can talk about how great we are all day long, but it doesn’t matter. When a client talks about how we helped get Mom on Medicaid and helped them come up with a plan—that’s what resonates with people. All of our staff members are phenomenal, and we compliment them often. But again, those compliments mean so much more coming from the clients. Everyone on our staff is here because they want to help people; the public recognition they receive is priceless. Is it Really This Easy to Get Reviews? So we may have left out one tiny detail. DeLoach, Hofstra & Cavonis was already delivering exceptional services to their clients. They already had an abundance of satisfied clients, they had just failed to implement an internal process to ASK and follow-up with clients for reviews. Not every person will leave a review, so it is important to ask as many satisfied clients as possible for their feedback. It always helps to have genuinely satisfied clients, so first make sure you are proud of the services you provide. Our marketing services team consulted with Simone and DeLoach, Hofstra & Cavonis to outline and implement the review generation strategy to improve their online reputation and we can do the same for you. Contact our digital marketing team to learn how we can help you succeed online.